Two buildings in downtown Cheboygan will be receiving face-lifts with owner investments and matching grants. 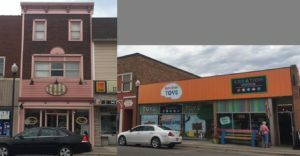 The City of Cheboygan has been working over the past few years with owners of two (2) downtown buildings, and representatives from NLEA and the Michigan Economic Development Corporation (MEDC) to complete the necessary applications and steps for receipt of a Community Development Block Grant (CDBG). The $264,815 in grant funds will assist in renovation of historic properties to remove instances of blight such as replacing siding, brick repair, and installing new exterior doors and windows. These activities will be matched with $264,980 in private funding to complete activities including new awnings, interior renovations, updated HVAC, and a new roof. The participating buildings house the following businesses: Creation Station, Right Brain Toys, and Daddy Dolls at 222 N. Main Street, as well as Simply Marcella and The Queens Head situated on 223 N. Main St. The renovations will occur over the next 24 months, and project administration will be provided by NLEA staff. Stay tuned as progress continues. The MEDC offers a variety of opportunities and grant programs for more projects than just façade work. Contact NLEA at 231-582-6482 or email jess@northernlakes.net to discuss potential projects and available assistance.